If these brotherhoods existed in Steiner's time, could they still be active today? 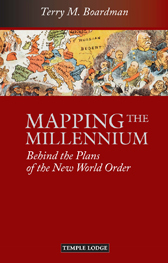 Based on detailed research, Boardman concludes that such groups are directing world politics in our time. As backing for his theory, he studies a series of important articles and maps - ranging from an 1890 edition of the satirical journal Truth to more recent pieces from influential publications that speak for themselves. He concludes that vast plans are in progress for a New World Order to control and direct individuals and nations, and he calls us to be vigilant, awake and informed. TERRY M. BOARDMAN, born in Wales in 1952, graduated with aÂ BA History (Hons) from Manchester University. He lived and worked in Japan for 10 years and currently resides in the West Midlands, England, where he works as a freelance lecturer, writer and translator of German and Japanese. He is also the author of Kaspar Hauser - Where did he come from? (2006). His website is: www.threeman.org.